Guatemala’s Fuego volcano exploded again Tuesday, sending rescue workers scrambling for cover beneath the smoking peak, as the death toll from the weekend’s eruption rose to at least 72. 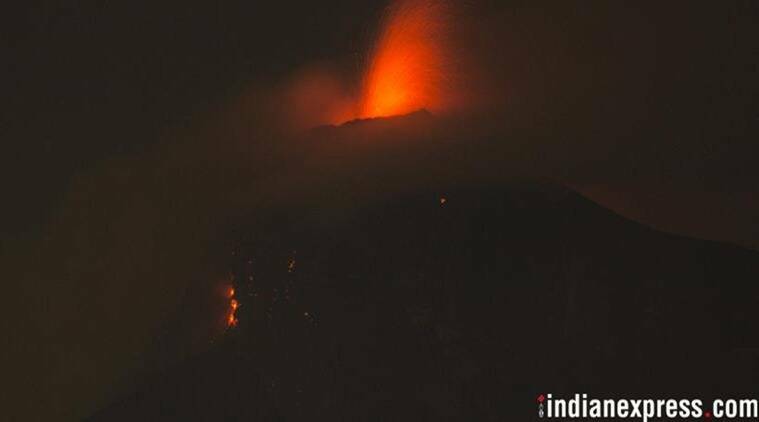 National disaster agency CONRED ordered evacuations and said that hot gas and molten rock were streaming from the volcano, which produced its biggest eruption in more than four decades on Sunday, showering ash on a wide area and sending lava flows through nearby towns. Before evacuations were ordered, authorities said the death toll had risen to at least 72, three higher than Monday. Volcan de Fuego, which means “Volcano of Fire” in Spanish, is one of several active volcanoes among 34 in the Central American country. It lies near the colonial city of Antigua, a UNESCO world heritage site that has survived several major eruptions. The latest activity has been mostly on the far side of the volcano, facing the Pacific coast. The eruption on Sunday sent columns of ash and smoke 6.2 miles (10 km) into the sky, dusting several regions with ash. Thousands of people have been evacuated, CONRED said.